To follow the last post about Mary McConnel, here is a snippet about another member of the McConnel family. John McConnel was the younger brother of David McConnel (Mary's husband) and followed David to Moreton Bay in 1842. With a third brother, Frederick, the McConnels were partners in Cressbrook station as mentioned in the previous post. When the partnership was wound up in 1861 John McConnel became a member of the Legislative Council, the upper house of the Queensland parliament (since abolished). It would be interesting to know whether John's new occupation was the cause or effect of the Cressbrook partnership being wound up. In 1864 John McConnel commissioned architect Benjamin Backhouse to build him a fine residence at Shorncliffe, overlooking Moreton Bay. This is what it looked like circa 1904. The house was sold to solicitor David Brown in the mid-1880s, and he named it Morven after his Scottish home town. 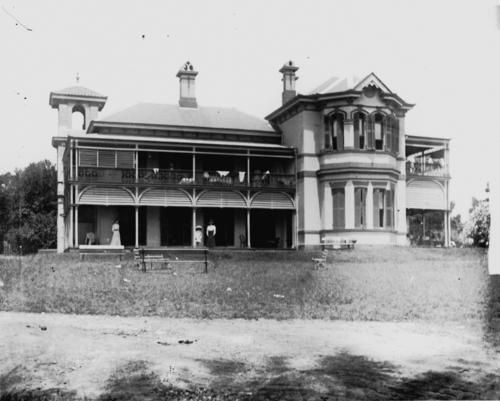 Apparently at around this time the house was leased extensively as a summer residence by the then governor of Queensland, Sir Henry Wylie Norman. There were several changes of ownership including a period where it operated as a guest house, until around 1951 when Morven was purchased by the parish priest of Sandgate, Fr O'Rourke, whose intention was for it to become a boys' school, and that is the function of the building today. It is part of St Patrick's, a Christian Brothers college, and it opened in 1952 with an enrolment of 172 students and now has over 1200 young men who would have celebrated St Patrick's Day last week. Here is a current photograph of Morven as seen on the school's web pages. In 1971 I interviewed for a teaching position at the school. Since I was unsuccessful, I didn't get to see much of the inside of the building. Glad to see it is still standing. It is good to have an older building in safe hands, although even then things can go wrong; eg Customs House. An interesting history of the school building.